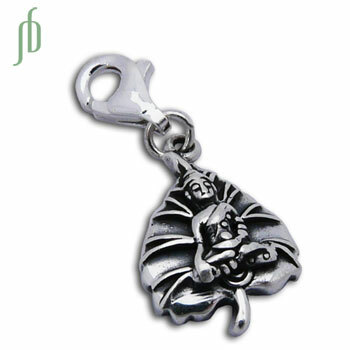 Sterling silver bodhi leaf charm with meditating buddha. The little buddha pendant is part of our charmas line. It is a 1.5 cm charm with a lobster clasp to make it easy add to your charm bracelet or necklace. The bodhi leaf symbolizes enlightenment and buddha is an embodiment of compassion. The oval chain bracelet is made of sterling silver. It is perfect for use with our charmas good karma charms collection. You can use it as a base and buy whichever charms suit your fancy. Change them out based on your mood and add to your collection as you like. Sweet little bodhi leaf earrings with Buddha meditating on them. The bodhi leaf a a symbol of enlightenment. Silver bodhi leaf pendants with a buddha meditating. The bodhi leaf is an important buddhist symbol reminding us of Buddha's enlightenment as he was sitting under a bodhi tree when he became enlightened. You can combine it with any of our necklaces to make a Buddha's Enlightenment necklace.